The largest of several islands at the mouth of the Piscataqua River, this town was originally known as Great Island. Chartered in 1679 as a parish of Portsmouth, it was incorporated in 1693. New Castle is unique in the state, being the only town made up entirely of islands, connected to the mainland by bridges. New Castle is home to the Wentworth-by-the-Sea Hotel, site of the Russo-Japanese Peace Treaty of 1905, mediated by Theodore Roosevelt. Portsmouth Harbor Light – an automated cast iron lighthouse built in the 1870’s is located at the mouth of the Piscataqua River, at the U.S. Coast Guard station here. The light still brightens the entrance to Portsmouth Harbor. 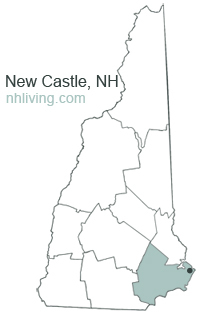 To share any New Castle, NH information with us, please contact us. Learn more about advertising in NHLiving.